Special Home-School Presentation & Mini-Class - Land O' Lakes Area Artisans, Inc.
Land O' Lakes Area Artisans, Inc. In honor of youth art month, eagle river artist, debbie jircik, will join students at the land o’ lakes library to talk about contemporary japanese artist, yayoi kusama – also known as the polka dot lady. Monday, March 11 11:30 – 12:30 Land O’ Lakes Library – downstairs Community Room. FREE Event. Suitable for ages 5+ and parents are welcome. Please RSVP below, by March 8, so we can have enough materials ready. Thank you! Kusama is an avant-garde sculptor, painter and novelist. She started to paint using polka dots and nets as motifs at around age ten, and created fantastic paintings in watercolors, pastels and oils. Her artistic career spanning eight decades includes work in sculpture, paintings, film, performances, fashion, poetry and writing. 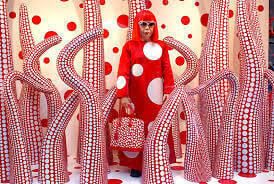 Kusama is also well known for creating glass infinity rooms, and she continues to create art today at age 89. Should the weather be unkind, and area schools are closed, this event will be canceled and rescheduled for another date. If you have questions, please contact the LOLA office at 715-547-3950. President of LOLA Board Appointed to WI Arts Board! Now Hiring LOLA Summer Arts Interns! What is LOLA Doing to Support Arts in Education? © 2015 - Land O' Lakes Area Artisans, Inc.